Libyan Spider, LLC has just sold short and jingling domain name dai.ly to Dailymotion, a popular video sharing web portal. Dailymotion is not [yet] YouTube, but being in Alexa top 100 already for a while, it is poised to progress in the right direction. It is current.ly #13 in France and is in Alexa top 50 in many European countries. Now with dai.ly, Dailymotion can expect even more traffic to their web site. Good choice indeed. 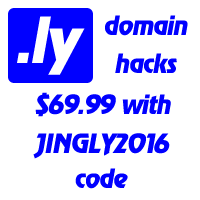 The question is what will happen to other time.ly domains: week.ly, month.ly, quarter.ly and year.ly? My favourite so far is week.ly/top - putting three best magazines on one single page. Just checked biweek.ly is taken too. For those real.ly interested: semiquarter.ly and few more are still for grabs. Great choice of dai.ly. I only wonder why they let daily-motion.com be squatted? Any idea how much did Dailymotion pay for this domain? Wow! instead of typing dailymotion.com which is 15 letters, you type dai.ly which 6 on.ly, it is amazing how domain jingles helps people around.